Harmony. Used - Very Good. Very Good condition. Very Good dust jacket. Harmony. Used - Like New. Like New condition. Like New dust jacket. Harmony, 2006. 1st Edition . Hardcover. New/New. 8vo - over 7¾ - 9¾" tall. Harmony, New York, NY, U.S.A., 2006. Hardcover. Book Condition: New. Dust Jacket Condition: New. 1st Edition. 8vo - over 7¾ - 9¾" tall. First Edition stated, with correct number line sequence, no writing, marks, underlining, or bookplates. No remainder marks. Spine is tight and crisp. Boards are flat and true and the corners are square. Dust jacket is not price-clipped- collectible.There are at least 68 million dogs in America, and their owners lavish billions of dollars on them every year. So why do so many pampered pets have problems? In this definitive and accessible guide, Cesar Millan-star of National Geographic Channel's hit show Dog Whisperer with Cesar Millan-reveals what dogs truly need to live a happy and fulfilled life. Crown Archetype, 2006-04-04. First Edition. Hardcover. Very Good. 1st edition.Nice looking book, has minor edge wear. New York: Harmony Books, 2006. SIGNED - To Chancel - by the AUTHOR on the front free end page. 15th printing. Book is in Very Good + condition. Boards are clean, not bumped. Fore edges have a small amount of reading wear. Interior is clean and legible. Not remaindered. Dust Jacket is in Very Good + condition. Tiny bit of edge wear, tiny bit of crinkle. Not price clipped. Dust Jacket is covered by Mylar wrapper. Thanks and Enjoy. All-ways well boxed, All-ways fast service. Thanks.. Signed by Author. Later Printing. Hard Cover. Very Good +/Very Good +. NEW YORK: HARMONY BOOKS. VG/VG LIGHT WEAR TO DJ, IN MYLAR. Pages: 300. . 2006. LATER PRINTING. HARDCOVER.. Condition: VG/VG LIGHT WEAR TO DJ, IN MYLAR. Pages: 300. Three Rivers Pr. 1 Reprint. Nature, Animals & Pets. New. Brand New: This item is brand new unopened, never used and still in its original manufacturer condition. Three Rivers Press. PAPERBACK. 0307337979 Special order direct from the distributor . New. Harmony, September 2007. Trade Paperback. New. Three Rivers Press. PAPERBACK. 0307337979 . New. Three Rivers Press, 2007-09-18. Paperback. Like New. Three Rivers Press, 2007-09-18. 1 Reprint. Paperback. Used:Good. Three Rivers Press. PAPERBACK. 0307337979 *LIKE NEW* Ships Same Day or Next! . Fine. Three Rivers Press. PAPERBACK. 0307337979 *BRAND NEW* Ships Same Day or Next! . New. Three Rivers Press. Used - Very Good. Very Good condition. Harmony. Hardcover. 0307337332 . Fair. 2006. Harmony. Hardcover. 0307337332 . Very Good. 2006. Harmony. Hardcover. 0307337332 Ships promptly from Texas. . New. 2006. New York, New York, U.S.A.: Harmony Books, 2006. 300pp including glossary and index The natural, everyday guide to understanding & correcting common dog problems Photographs Cartoons. Cloth Hardback. As New/As New. Crown Archetype, 2006-04-04. Hardcover. Like New. New York: Three Rivers Press, 2006. 1st Paperback Edition . Trade Paperback. Very Good. 8vo or 8° (Medium Octavo): 7¾" x 9¾" tall. Jennifer O'Connor (Cover Design); Alan Weissman (Cover Photo); Barbara Sturman (Design). 298 pp. Stated first paperback edition! Solidly bound copy with moderate external wear, crisp pages and clean text. Synopsis: There are at least 68 million dogs in America, and their owners lavish billions of dollars on them every year. So why do so many pampered pets have problems? In this definitive and accessible guide, Cesar Millan star of National Geographic Channel's hit show Dog Whisperer with Cesar Millan reveals what dogs truly need to live a happy and fulfilled life. From his appearances on The Oprah Winfrey Show to his roster of celebrity clients to his reality television series, Cesar Millan is America's most sought-after dog-behavior expert. But Cesar is not a trainer in the traditional sense his expertise lies in his unique ability to comprehend dog psychology. Tracing his own amazing journey from a clay-walled farm in Mexico to the celebrity palaces of Los Angeles, Cesar recounts how he learned what makes dogs tick. In Cesar's Way, he shares this wisdom, laying the groundwork for you to have stronger, more satisfying relationships with your canine companions. Cesar's formula for a contented and balanced dog seems impossibly simple: exercise, discipline, and affection, in that order. 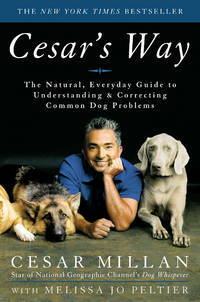 Taking readers through the basics of dog psychology and behavior, Cesar shares the inside details of some of his most fascinating cases, using them to illustrate how common behavior issues develop and, more important, how they can be corrected. Whether you're having issues with your dog or just want to make a good bond even stronger, this book will give you a deeper appreciation of how your dog sees the world, and it will help make yourrelationship with your beloved pet a richer and more rewarding one. Learn what goes on inside your dog's mind and develop a positive, fulfilling relationship with your best friend. Harmony. Hardcover. 0307337332 May have light shelf wear. . Very Good. Harmony. Hardcover. 0307337332 Ships from Tennessee, usually the same or next day. . New. 2006. Harmony , April 2006. Hardcover. Used - Very Good. Harmony , April 2006. Hardcover. Used - Like New. Three Rivers Press, 2007-09-18. Paperback. Good. Ships daily from the sunshine state! Has a few dogeared pages with minimal wear. Three Rivers Press, 2007-09-18. Paperback. Acceptable. Ships daily from the sunshine state! Exterior shows light wear to edges & corners, inside is faded, but appears unmarked. Three Rivers Press, 2007-09-18. Paperback. Acceptable. Ships daily from the sunshine state! Three Rivers Press. Paperback. 0307337979 . Very Good. 2007. Three Rivers Press. Paperback. 0307337979 . Fair. 2007. Three Rivers Press. Paperback. 0307337979 . Good. 2007. Crown Archetype, 2006-04-04. Hardcover. Good. Harmony, 2006-04-04. Hardcover. Like New/Like New. Book has slight shelf wear from storage and use; otherwise the book is in excellent condition. Harmony. Hardcover. 0307337332 . . New. 2006. Harmony, September 2007. Trade Paperback . Used Good. We carry new and used books in our storefront. We want you to be satisfied with your purchase. Please contact us if you have questions regarding this item. New York: Harmony Books, 2006. 1st Edition . Hardcover. Like New/Like New. 8vo or 8° (Medium Octavo): 7¾" x 9¾" tall. Jennifer O'Connor (Jacket Design). 298 pp. Clean, fresh copy and dj with very light shelf wear, crisp pages and clean text. New York, New York, U.S.A.: Crown Pub, 2006 DJ has very minor shelf wear. Covers and textblock are clean with sharp corners. Pages of text are clean, bright and free of markings. Binding is tight and secure. ***We ship daily. Our books are carefully described and packaged in boxes (not envelopes). A gift card and personalized message can be included upon request.*** . Hard Cover. Fine/Very Good. 8.50 x 5.75. Three Rivers Press, Sep-07. Trade Trade. Used - Acceptable. Satisfaction Guaranteed! !